Enjoy rural peace in Greygles, a spacious, well-equipped self catering stone cottage, with delightful views, on the edge of a friendly village set in the hills of central Dorset. Experience the English countryside at its best. Greygles. This is the perfect location for a Dorset weekend break or a longer holiday. 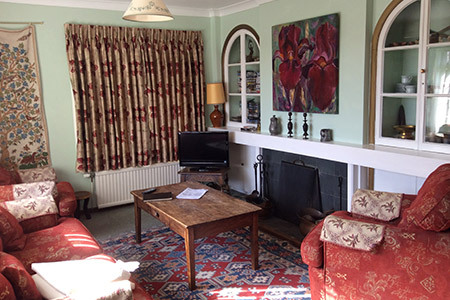 A wonderful holiday let in Dorset. Dorset is delightful – close to London, the South East and the Midlands, this is already the South-West of England and feels as though it is a different world. It has more sunshine and less rain than either Devon or Cornwall and allows you to take your own pace to discover it all for yourself. 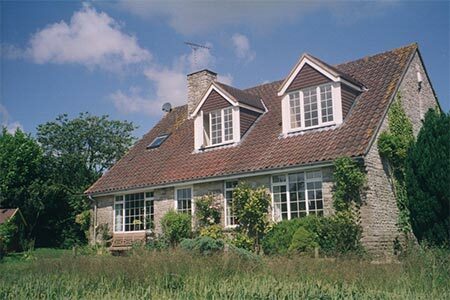 Self catering cottage Dorset or perhaps a weekend break in Dorset? The house offers the feel of a country cottage in Dorset but with modern facilities and space for a family party. It comfortably sleeps up to seven people. There are four bedrooms in all – 2 doubles, one twin, and one single. Of the double bedrooms, one – with a bathroom and toilet next to it – is on the ground-floor. If required, a fold-out single ‘Z-bed’ can also be set up. In addition, 2 cots and a high-chair are available. For young children, there is the fun of a Wendy house in the garden. Greygles offers rural quiet combined with comfort and easy access. Set in rural England at its best, and in a very scenic location, there are also plenty of places of interest nearby. Set in Melcombe Bingham, right in the heart of Thomas Hardy country. At the centre of Dorset’s best walking country, and only just off the Wessex Ridgway long distance path. Close to the last home of Lawrence of Arabia. Only a half-hour drive to the dramatic Jurassic Coast. Within easy reach of a wide range of old towns, ancient abbeys, and beautiful gardens – plus the rude giant of Cerne Abbas and even the famous Bovington Tank Museum. 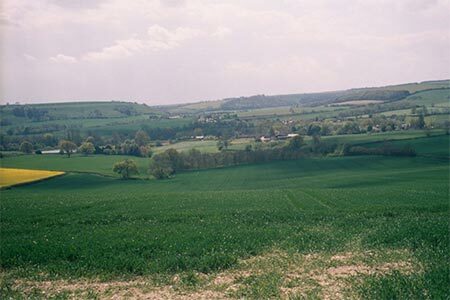 Looking down to Melcombe Bingham and beyond to the Dorsetshire Gap, a walkers’ crossroad and natural dip in the hills. ‘Greygles’ is an old Dorset word for the bluebells which abound in the local woods in Spring. From this cottage in Dorset, it is easy to see the county in its full beauty. © 2019 Greygles. All rights reserved.